Want to enjoy Princeton University’s campus from the perspective of a current student? 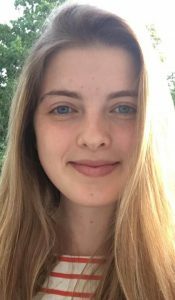 My name is Maia and I am a member of Princeton University’s class of 2020. Because I grew up in the greater Princeton area, I was fortunate enough to explore the university’s campus throughout my childhood. As a result, I have discovered the best spots on campus to be productive, inspired, or relaxed. Competing at Princeton University’s DeNunzio Pool in middle school motivated me to swim faster with the hopes that an expansive, state-of-the-art facility like DeNunzio would become accessible to me in college. In high school, tackling SAT practice tests in Lewis Science Library surrounded by college students who were top scorers in the country enabled me to push on as my eyes glazed over yet another critical reading passage. 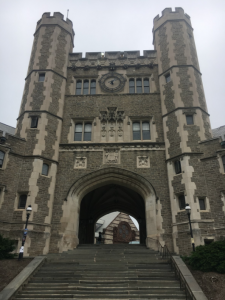 Since spending time on Princeton University’s campus motivated my college application process, I am writing to inform you of spaces accessible to the public on campus. 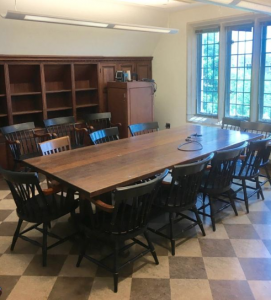 The East Asian Library, located on the third floor of Frist Campus Center, features study carrels and rustic, secluded seminar rooms for group study in the Jones Hall section. Lewis Science Library, my personal favorite library, offers study rooms equipped with chalk boards and ample natural light on the third and fourth floors. Stokes Library, located in the basement of Wallace Hall on Prospect Street, offers standing desks and outside study tables. Cotsen Children’s Library is located on the main floor of Princeton University’s Firestone Library. The entrance to the gallery is to the right amongst a wood panel wall with glass windows. A number of my friends enjoy tackling academic readings in the whimsical Bookscape reading space. For full library hours, visit the Princeton University library website. Beyond utilizing libraries as study spaces, the Princeton University libraries also allow visitors to use most collections. In order to obtain a borrower’s card, visitors must visit the Access Office in Firestone Library. 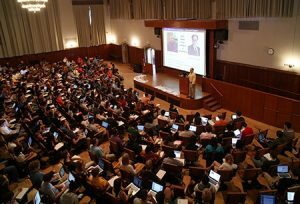 Beyond studying at libraries, another way you or your students can experience Princeton’s intellectual community is by sitting in on classes. If you are 18 or older and are interested in a semester-long commitment to learning in the same setting as Princeton students, there is ample opportunity to do so. Although official auditors must be 18 years or older, students interested in attending a class may also do so when they visit campus for a tour. More information on tours can be found later in this article. In order to attend a class before or after a tour, you can obtain a list of available classes from the welcome desk at Clio Hall. There are numerous retail dining options on Princeton University’s campus available to community members. A variety of retail dining options are located in Frist Campus Center off Washington Road. At Frist, you can get anything from chicken fingers and fries in the Food Gallery to a green smoothie at Café Vivian or ice cream from the Bent Spoon at Witherspoon’s. Atrium Cafe – located on the 100 level of the Louis A. Simpson International Building, serving coffee, pastries, sandwiches, salads, wraps, soup, and sushi. Chancellor Green Cafe – located in Chancellor Green, serving coffee, tea, pastries, sandwiches, salads, wraps, soup, sushi, and hot entrees. Chemistry CaFe – located in the atrium of the Frick Chemistry Building, serving continental style breakfast, coffee/tea, fresh pastries, and hot and cold lunch selections. EQuad Cafe – located in the C Wing of the Engineering Quad, serving espresso/coffee, pastries, sandwiches, salads, wraps, soup, sushi, and hot entrees. Genomics Cafe – located in the Icahn Laboratory, serving coffee, pastries, sandwiches, salads, wraps, soup, sushi, and hot entrees. Prospect House – The Garden Room is a full-service restaurant and is open for lunch Monday through Friday. Reservations can be made here. The Tap Room is located on the lower level, serves hot and cold entrees for lunch, and does not require reservations. Studio ‘34 – located in the lower level of 1967 Hall at Butler College, serving hot and cold food items, and featuring both indoor and patio seating. 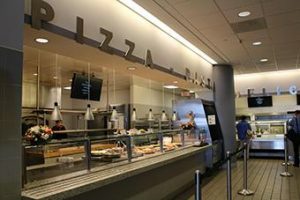 Woodrow Wilson Cafe – located in the Shultz Dining Room on the first floor of Robertson Hall, serving continental breakfast and hot lunches. Most of the options above accept cash, but bring a credit card just in case! I would say that, for prospective college students, spending time in performing arts venues is equally as important as studying in a library. Witnessing the caliber of extracurricular activities achieved by University students can break the common misconception that test scores and grades are the only determinant of a successful college applicant and, in turn, inspire well-rounded, motivated students. Performing arts groups are an integral component of Princeton’s tradition. Student performers have been donning orange and black plaid jackets and resonating their voices through hollow arches for almost a century. Blair Arch, a popular venue for a cappella concerts. Information regarding performances for these traditional groups can be found on the Office of the Dean of Undergraduate Students website. On the website, a cappella performances are listed as the group name followed by “Arch” because the groups historically perform outdoors under arches on campus. All arch sings are free. In addition, Princeton University Band performances are also free of charge during sporting events. View the full band schedule. Triangle shows are held at McCarter Theatre located near the Dinky train station. In order to purchase tickets to Triangle shows, visit the university’s universal ticketing website. BodyHype Dance Group. Source: BodyHype FB Page. In my opinion, some of the most exciting student performances are those organized by student dance groups. 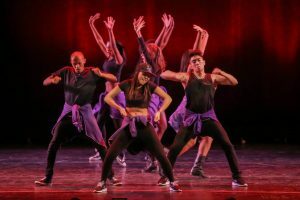 Whether it’s a sharp hip-hop number by the Black Arts Company (BAC), a smooth contemporary piece by BodyHype, or a traditional East Asian dance by Triple 8, I am always moved by the choreography of my fellow students. Dance groups usually perform once at the end of each semester. 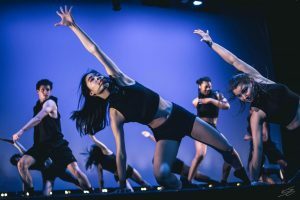 Therefore, peruse the ticketing site around January and April to look for dance shows that will most likely be held in the Frist Campus Center Film and Performance Theater. In addition to attending performing arts events, another campus activity that could be of interest to artistically inclined students is a gallery tour of the Princeton University Art Museum. Schedule a tour. As a kid, I remember sitting in the backyard of the old Lewis Center for the Arts on Nassau Street, Thomas Sweet ice cream in hand, straining to peer through the windows and marvel at the student art inside. The new Lewis Center for the Arts, with its immense open spaces and transparent exterior, makes student art at Princeton University accessible to students and the larger community alike. Located off Alexander Road, the new Lewis Center for the Arts is perhaps the most modern space on campus. It opened less than a year ago in October 2017. 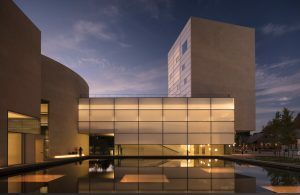 The center, comprised of three different buildings, encompasses a wide range of the arts including dance, music, music theater, and theater. It is part of Princeton University’s new arts and transit complex, which encompasses the NJ train station, Wawa convenience store, Dinky Bar, and Cargot Brasserie. Grab a bite to eat and see all that the new Lewis Center has to offer. 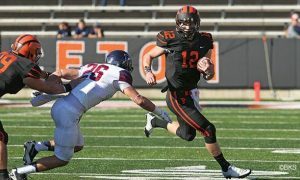 Beyond further informing visitors of the caliber of extracurricular activities at Princeton, the school spirit demonstrated at sporting events is a great way to make students excited about going to college. Furthermore, attending a sporting event can be a great study break for your student: Princeton Stadium, Finney and Campbell Fields, and Weaver Stadium are located just steps away from Lewis Science Library. Most events are free; however, football games require a ticket purchase. For anyone interested in football, I would recommend attending the games against Harvard or Yale. More Princeton students tend to watch those games because if Princeton triumphs over both schools, there is a huge bonfire in front of Nassau Hall! 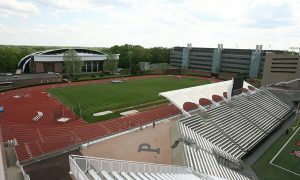 If you wish to use Princeton’s athletic facilities for your own athletic endeavors, as I did in middle school, Weaver Stadium’s outdoor track, at Finney/Campbell practice fields, are most always open. DeNunzio Pool offers a recreational membership for community members. Outdoor tennis courts at the Lenz Tennis Center are open and free, but subject to availability and weather. Indoor tennis courts are available in Jadwin Gym and are also open to the public (subject to availability), but you must purchase a Tennis Permit to reserve courts. If your workout buddy happens to be a Princeton University student or faculty member, and exercising indoors is more your speed, Princeton University’s Dillon Gym offers opportunities for those not affiliated with the University to use the facility. If you wish to combine campus exploration with your athletic endeavors, there are ample trails on and around campus open to the community and students alike. My personal favorite place to run is on the towpath, a gravel/dirt road along the Delaware and Raritan canal that spans over 30 miles. Check out these running routes provided by the Princeton Running club that spans the towpath and beyond. More campus-centered routes can be found here. View a full list of athletic facilities that the University has to offer at this link. For various reasons, such as out-of-season athletes using the fields, agreements between club sports teams and the University, or University-sponsored camps, you may find that these facilities are accessible to the public throughout the year. As long as you are not being disruptive to organized activity taking place in these spaces, and respect the spaces themselves, feel free to hop on the field yourself! In addition to attending sports games, another way to witness Princeton’s school spirit firsthand is to attend some events associated with Princeton reunions, held annually around the end of May. Although many events require alumni wristbands to gain entry, events such as the “P-rade” are open to the public. 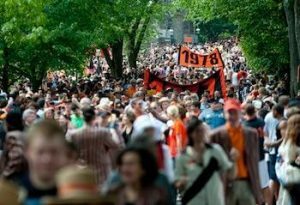 During the P-rade, a black-and-orange sea of alumni and undergraduates march along a mile-long route spanning town and campus. Another exciting reunions event accessible to community members includes the Reunions Concert and Fireworks. Reunions events accessible to the community can be found on the website of the Community and Regional Affairs Office. 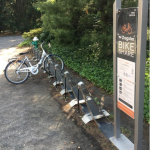 To explore the campus at large, Princeton University recently installed Zagster Bike Share on campus. After paying a flat fee of $20, both visitors to and people affiliated with the University can use a smartphone app to rent a bike from various locations throughout campus. Click here to learn more about membership and locations. Throughout the year, Princeton University hosts and sponsors events aimed at uniting the University and community at large. For the whole family, the University hosts and supports events accessible to the community throughout the year. 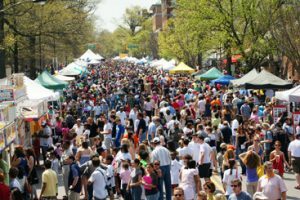 You have probably heard about Communiversity ArtsFest, Central New Jersey’s largest and longest-running cultural event drawing over 40,000 people for food, art, live entertainment, and showcasing of local businesses. Communiversity is produced by the Arts Council of Princeton with participation from the students of Princeton University and support from the town of Princeton. However, not all Princeton University-sponsored community events span the entirety of Nassau Street. To learn about events throughout the year, you can subscribe to UPROAR, an e-newsletter outlining public events, sent out the first of every month. I hope that, as a result of this post, more visitors and aspiring college students (and parents) in the Princeton community will join me on campus. Spending time on a campus with outstanding facilities and ample resources during my college application process made my college goals more tangible and motivated me to keep pushing forward through stressful exams and late nights of work. I hope your student has a similar experience! Is there anything else that I missed? Let me know!